CHANGING OUR WORLD ONE STITCH AT A TIME. 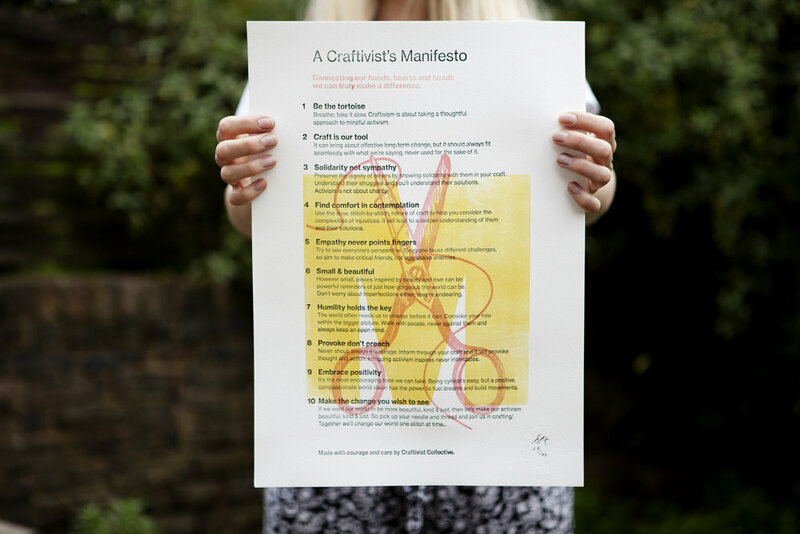 The Craftivist Collective is exactly that – a collective, an inclusive group of people committed to using thoughtful, beautiful crafted works to help themselves and encourage others be the positive change they wish to see in the world. It started with just one person: Sarah Corbett, an award-winning campaigner with 30 years’ practical experience as an activist. Today the award-winning Craftivist Collective has thousands of members, who Sarah supports by developing tools and projects that they can undertake as individuals or by organizing their own small group stitch-ins, plus sporadic events when she can. Sarah has also delivered talks, workshops and events to over 12,000 people around the world. Her first book, A Little Book of Craftivism, came out in 2013 and a more in-depth guide, How to be a Craftivist: the Art of Gentle Protest, was released in Feb, 2018.